If you have read books on missional living and incarnational living this will not be new stuff. 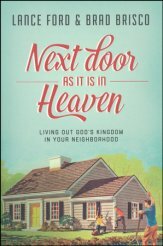 But these guys put it all together in one place (quoting many other authors) and focus missional living to the neighborhood in which you live. They give you reasons for the the who and why, and give you options and ideas for the what and where and how. They are inspiring and challenging and leave you with the desire to get to work getting to know the people in your neighborhood. The authors talk a lot about using meals to spend time with others building relationships. They mention that "A primary (maybe the primary) venue for evangelism in Jesus' life was the meal. Eating and drinking with others is a constant theme throughout the biblical history of how and what Jesus did during his earthly ministry. Churches are most often found meeting. Jesus was most often found eating. If you were to bump into him on the streets of Jerusalem, he would have been more likely to invite you to a barbecue than to a Bible study." "Christians should see their calling as missionaries to their neighborhoods as being every bit as high of a calling as the calling to preach in a pulpit." The authors are big advocates of the front porch. We should set aside time in our lives to get to know our neighbors, spend time with them, and be available to them. "If you have a front porch, use it! ", they write. This book will be an inspiration to all who read it. I highly recommend it. A copy of this book was provided by the publisher for the purpose of review. 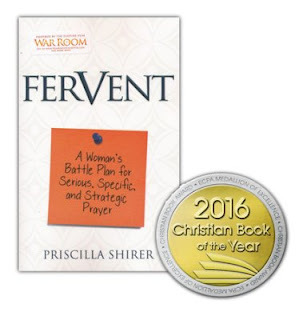 Ladies, this book was written for you, by a fellow believer in Christ who wants you to know the joy of Jesus and victory over Satan. She has your best interest at heart as she teaches how to pray, how to use scripture in your prayers, and how to pray against our enemy, the devil. We can't just talk about prayer, we have to pray! We can talk to God about everything and we should. Daily! With fervency! She encourages you to write down your prayers and to write down scripture you want to use while you pray. Go to a place alone (like a closet) where you won't be distracted and talk to God about all of life. This book is a great tool to have in your hands to read, underline, share with others, and read again. The audiobook is also inspiring, as Priscilla reads it with all her passion. This biography takes you on the wild ride of Shawn's life growing up with a mother who had a traumatic brain injury and a father who had a strange way of dealing with things. Both of his parents were Christians and they always went to church, but this in no way meant their life was "normal", nor even acceptable. Be prepared to be astonished, appalled, and amazed. It was such a bizarre way of life and yet Shawn and his younger brother miraculously came to faith in Christ and both became ministes of the gospel as adults. Through the limitations, hardships, and darkness of his mothers problems, you will gain more understanding of how God can use the disabled and broken hearted to reach others for Christ. A copy of this book was provided by Tyndale for review purposes. 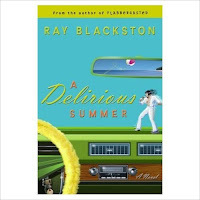 A Delirious Summer by Ray Blackston (Revell 2004) is so well written—the metaphors outstanding and the characters colorful and spicy. The audiobook (Oasis Audio 2004) is also excellently narrated by Andrew Peterson, who voices both the male and female characters marvelously. I knew nothing about this book going into it—I was only looking for a summer audiobook to listen to. I was pleasantly surprised to find the book opens in Quito, Ecuador, a place I have visited on a short term mission trip. The main character, Neil, is a language teacher there for missionaries needing to learn Spanish. Neil is a single man who then takes his 8-week furlough in Greenville, South Carolina, hoping to find nice Christian women to date. He gets more than he bargained for and ends up leading a short term mission team (made up of a hodgepodge of characters), to the jungles of Ecuador. The story gives you plenty of laughs along with things you may take away and ponder. By the end of the book, I wanted more. After a little research, I found that this is book #2 of a trilogy, but not one that absolutely needs to be read in order. The first book in the series is Flabbergasted 2003 , and the third book is “Lost in Rooville” 2005. These are also read by Andrew Peterson for the audio versions.